The Kids Are Alright is doing alright after all. ABC just announced they’ve given a full season order to the freshman TV show. Set in the 1970s, the comedy centers on the Clearys, an Irish-Catholic family living on the outskirts of Los Angeles. The cast includes Michael Cudlitz, Mary McCormack, Sam Straley, Caleb Foote, Sawyer Barth, Christopher Paul Richards, Jack Gore, Andy Walken, and Santino Barnard. While it’s unclear if ABC will renew The Kids Are Alright for a second season, the full season order is a good sign. So far, the series is averaging a 1.25 rating in the 18-49 demo and 5.662 million viewers. Tuesday night comedies “The Kids Are Alright” and “Splitting Up Together” have been given full-season orders, Channing Dungey, president, ABC Entertainment, announced today. New series “The Kids Are Alright,” from ABC Studios, premiered in October. From creator and executive producer Tim Doyle (“Last Man Standing,” “The Real O’Neals”), the series is inspired by Doyle’s own childhood. 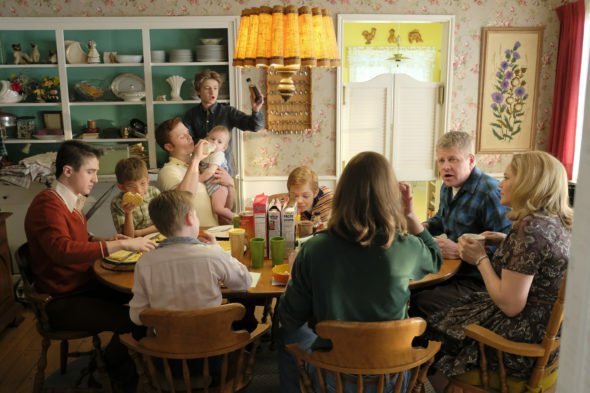 This ensemble stars Michael Cudlitz as Mike Cleary, Mary McCormack as Peggy Cleary, Sam Straley as Lawrence Cleary, Caleb Foote as Eddie Cleary, Sawyer Barth as Frank Cleary, Christopher Paul Richards as Joey Cleary, Jack Gore as Timmy Cleary, Andy Walken as William Cleary and Santino Barnard as Pat Cleary. Randall Einhorn is also an executive producer. What do you think? Are you watching The Kids Are Alright? Do you want a second season? More about: ABC TV shows: canceled or renewed?, The Kids Are Alright, The Kids Are Alright: canceled or renewed? My husband (62) and I (60) LOVE this show. And so do my kids and grandkids. It’s so refreshing to see a show with a loving couple who work together, a father who’s portrayed as strong, loving and SMART and a mother who is smart and adjusting to the changing world. Funny, insightful, show. DO NOT CANCEL!!!! I hope they don’t cancel this show. I LOVE that show! It’s so funny & refreshing to actually see a show where the parents don’t have to answer to ( spoiled, overprotected) children. I’m sure ABC will get rid of it though as it doesn’t have a platform to bash anybody who isn’t alt-right socialist.